Fears that Australian swimming great Ian Thorpe could lose an arm after contracting a serious infection in his shoulder have been played down by his manager. Australian media reported the 31-year-old could lose the use of an arm. But manager James Erskine said: "He's not well but not in intensive care and no one has ever suggested he will lose the use of his arm." Erskine told BBC World Service: "He is on antibiotics but in good spirits." The five-time Olympic champion was admitted to rehab for depression earlier this year after being found by police behaving oddly near a car in Sydney. Erskine said: "He's had major surgery on a broken shoulder. Plates and pins. It wasn't successful and they had to operate again. "During that second operation he got an infection while he was in hospital. This was on top of rehab for depression. The infection really flared up when he left hospital. "The x-ray looks like the bionic man. He has tubes everywhere." Jim Wilson, chief sports correspondent for Australian broadcaster Channel Seven, said: "It's been a tough 12 months for Ian. He's been suffering from depression and gone through his own battle with the demons. Let's hope he can get himself right - he's an icon of Australian sport and a worldwide superstar. "I've known him for the best part of 20 years and I feel for him right now." Thorpe made his Olympic Games debut in Sydney in 2000, winning three golds there and another two in Athens 2004, but retired in 2006 because of a lack of motivation. 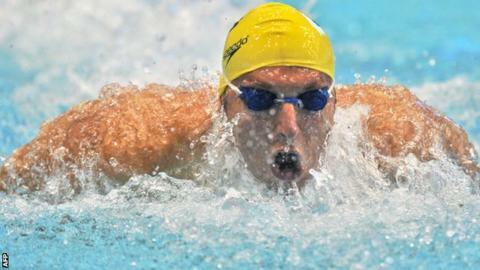 He made a comeback in 2011 but failed to make the Australian team for the London 2012 Olympics. Erskine insists Thorpe had no plans to compete again and said: "After not qualifying for London he said that was it. Never say never but at 31 he has other things in his life. "He likes cooking, travel and broadcasting. He will be at the Commonwealth Games but working for the BBC. There was never any question of his competing there. "Ian has done super human things in sport and because of that people will always be interested in him. "He gave some much happiness to so many people in Australia. For that reason people are pulling for him, generous towards him and want to see him well."